09 Jan 2019 --- Israel-based start-up, Yofix, one of the ten finalists in PepsiCo’s European Nutrition Greenhouse program, has been awarded the final €100,000 grant (US$114,000) following a six-month journey. 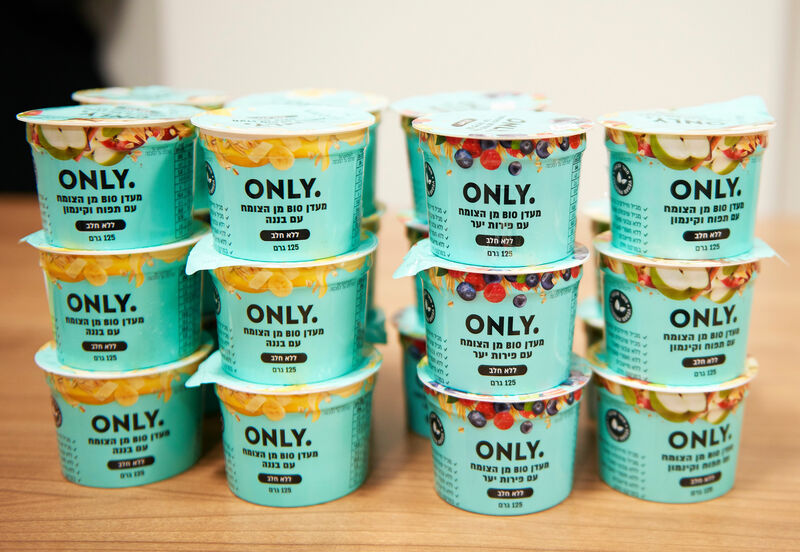 Yofix, which makes clean label plant-based fermented dairy alternatives impressed PepsiCo’s selection committee with its launch and retail growth during the program. “We are planning to expand outside of Israel, so we will be using the money to conduct market research, invest money in marketing and sales. We also want to expand our line of products, so there is currently lots of R&D going on,” Steve Grun, CEO of Yofix tells FoodIngredientsFirst following the announcement. “We are looking at couple of countries in Europe and looking at the total European market and we have to decide what will be first,” Grun notes. The company is focusing on a wide audience for their product line. “For sure this includes flexitarians, which incorporates people who just want to decrease their intake of dairy products. The vegan population is looking for great tasting dairy-free products. The lactose intolerant population is also a broad target audience. The other group of people that we also reach out to is those looking at their health, for products that are clean label and with great a nutritional makeup,” he explains. PepsiCo also gave each finalist a €20,000 grant to kick-start the program and help them accelerate their businesses to the next level. All ten companies have grown significantly, not only in terms of strategic brand evolution and expansion, but also financially, with sales of the collective group during the six-month program increasing by 145 percent compared to the same period last year. Yofix was chosen as the recipient of the €100,000 prize after an extensive review and assessment period, carried out by nine members of the Nutrition Greenhouse selection committee. The company significantly scaled up its operations during the six-month program, including completion of a manufacturing facility in September 2018, a nationwide new product line launch in Israel, as well as the strategic development of an international go-to market plan. 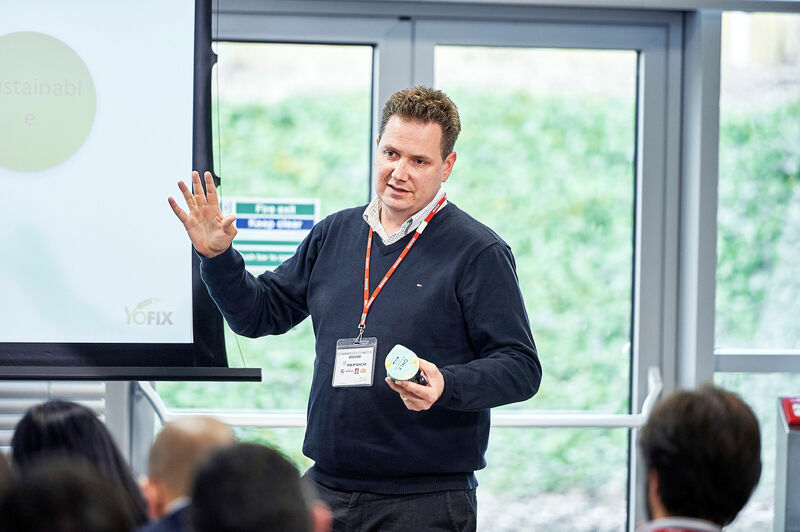 Yofix has been available as a proof of concept in Israel about one year ago and had a national launch in early November 2018, Grun explains to FoodIngredientsFirst. Click to EnlargeSteve Grun was appointed CEO of Yofix in 2018.The company was the first to join The Kitchen FoodTech Hub from the Strauss Group in Israel, which was founded in 2015. This was followed by an investment in the start-up by Strauss. Grun wouldn’t specify how much of the business they now own, but confirmed that Strauss led the Round A of investment a year ago. A Round B of investment is now being foreseen in the next couple of months, although exact details of investment raise targets are not being disclosed. In terms of remaining independent, Grun contends that for now the main area of focus is expansion. “We are an independent company with a couple of investors already. The main focus is to have a great product, launch and sales, and let’s see what goes from there,” he notes. Yofix offers a unique clean label formula that, rather than using a single ingredient, is based on a blend of five basic ingredients: oats, lentils, sunflower seeds, coconut and sesame. “It is totally different from what there is on the market today, which are typically based on single ingredients,” claims Grun. “This blend provides a lot of aspects, including texture and protein. It’s because of the mix and combination that we are providing a good matrix. The founder used hundreds of different ingredients in his kitchen at the beginning and in the end we came down to five basic ingredients to give a good basic texture and nutritional form,” he explains. Using a relatively long blend rather than a single ingredient is not a consumer issue, despite the growing demand for shorter ingredient lists, Grun contends. “People are looking for shorter lists of ingredients, but in reality they are looking for clean label formulas. What we don’t have is adding anything to our products such as thickeners, preservatives or flavors. We have five basic ingredients that you could buy in the shop yourself and cook at home. We have plain yogurt, with a total of seven ingredients. In the fruit products you have eight to nine ingredients, which is very short compared to other things on the market,” he claims. Yofix currently offers a spoonable yogurt alternative in a 125ml cup. “The idea that we have is that our technology and formula is versatile and flexible. We can change the fluidity of the products to have a drinkable yogurt, a product that is pre- and probiotic. You have great probiotics in it. So we can have a drinkable yogurt, a spread or a spreadable cream cheese alternative. We are in the dairy alternatives world, so all kinds of alternatives are possible. We can even make it possible with ice cream,” he notes. Click to EnlargeToday the company’s yogurts are both prebiotic and probiotic.“The probiotics are the live cultures that we are using in the fermentation process. It’s real live yogurt cultures. It’s a mix of couple of strains that are regularly used for yogurt products, but it is still totally vegan live cultures. It is also dairy-free and vegan,” he says. Another advantage is the zero waste sustainability strategy behind it. “All ingredients that we are using remain in the final product. It is a much fuller product giving a feeling of satiety. It’s not like soy, where the soy is milked where you are staying with a lot of dry matter afterwards that you need to find a solution for. Everything is taken inside,” he notes. Steve Grun was appointed CEO of Yofix in 2018, supporting Ronen Lavee, COO and Founder. Grun notes the interesting background to the launch. “The founder of company is not a food technologist, but rather an agricultural and mechanical engineer with lactose intolerance,” he explains. “Ronen worked in Asia for a couple of years and had no issue with lactose intolerance there because he wasn’t consuming a lot of dairy products. When he returned to Israel he discovered that there wasn’t a good enough offer on the market. He had no knowledge of additional ingredients and thickeners, so he didn’t use it. The greatest thing about the product line is that it is a clean label and stable product without adding anything. Everything comes back to the ingredients that he chose,” he adds. The PepsiCo Nutrition Greenhouse was first launched in 2017 to support breakthrough food and beverage nutrition brands aimed at European consumers. In 2018, its second year, ten companies were chosen based on uniqueness in the market, product quality and positioning, focus on health and wellness and scalable business model. A US version was also announced at the end of last year. All ten companies joined the six-month program in June 2018, each receiving a €20,000 grant. Company founders were paired with functional and brand experts from some of PepsiCo’s leading brands to help them achieve accelerated growth. The program included a dedicated schedule of in-person workshops and virtual training, designed to address critical early-stage business issues and overcome immediate market challenges. David Schwartz, Senior Director of Innovation, PepsiCo Europe & Sub-Saharan Africa, and leader of the program, commented: “It has been a privilege to partner with another stand-out group of exciting, innovative entrepreneurs in the second year of our Nutrition Greenhouse incubator program in Europe. Our vision remains steadfastly the same as when we launched in 2017; to support forward-thinking food and beverage start-ups deliver great-tasting, nutritious products to people around the world.” FoodIngredientsFirst featured a podcast interview with Schwartz last year. The program is a key part of PepsiCo’s Performance with Purpose 2025 agenda, which is aimed at continuously improving the products they sell through transforming their portfolio and offering more nutritious options. PepsiCo is therefore working to offer more whole grains, fruits and vegetables, dairy, protein and hydration as they expand their nutrition portfolio. As part of their 2025 agenda, the company’s goal is for the rate of sales growth of nutrition products to outpace the rate of sales growth of the balance of our portfolio. • Off the Eaten Path range in the UK, a series of vegetable- and legume-based products like Rice and Pea Chips and Pea and Pinto Bean Sticks. It was named Top Launch in the bagged snack category by The Grocer in 2017. • Quaker Oats Porridge to Go range in the UK to meet increasing consumer demand for everyday on the go, healthy, filling and affordable products. The range offers a 100 percent whole grain breakfast that is also a source of fiber and calcium. • Tropicana Essentials – a new duo of juices designed to offer consumers delicious drinks which meet the desire for functional benefits too. Their Vitality flavor aims to help reduce fatigue while Berry Boost seeks to protect cells from oxidative stress. Innova Market Insights recently listed “Small player mindset” as one of its key trends for 2019, where small players are shaking up the food & beverage industry by taking on the classic FMCG giants in an increasingly high-tech arena. The growing significance of small innovators in general is a global phenomenon. Their role as thought leaders has driven multinational companies and legacy brands to invest in them – and learn from them. Many of the big boys are venturing into the funding space or setting up investment competitions. Kombucha, cellular agriculture, clean meat and insect proteins are just some of the on-trend platforms in this golden age of creativity. Their strength as thought leaders has driven multinational companies and legacy brands to invest in them. These companies also have a marketing advantage. A 2018 Innova Market Insights trends survey found that two in five US and UK consumers prefer small brands “because they are more dedicated to their products and have a personal story.” This is completely on trend of course, as 20 percent growth has been reported in food & beverage launches with a social ethical claim (Global, 2017 vs. 2016). Grun welcomes the recent trend towards bigger companies investing or incubating start-ups. “It’s great that big companies are seeing the potential of smaller companies. Sometimes they are very innovative companies and they understand that they have their own great teams innovating internally but sometimes small companies have great ideas and it is a great thing for bigger companies to also look outside and support them,” he concludes.